Peoples Champz booth located right inside the front door. The Champ offers a variety of medible alternatives including juice, medicated chocolates from Canna Girl and more. Peoples Champz Edibles offer flowers too - at amazingly discounted prices given the quantity. And it's rumored that these guys are behind the legendary Illmatic strain. These are a classic Southern rendition of pecan pie with crispy crust, candied pecans and that gooey filling holding it all together. The cannabis flavor was unmistakably present to the initiated, but not in a bad way. Medibles should have a distinguishable cannabis flavor, primarily for safety's sake - but they must be tasty too. These single servings are the right size - but don't be tempted to double up because they are so delicious. And these pies are exquisitely tasty, but psychoactive. My sweetie is recovering from shoulder surgery. The surgeon gave him a script for oxycodone - which was particularly good when the nerve blocker pump ran out - but medical marijuana is allowing him to use a surprisingly small amount of pain medicine. Rest and recuperation is imperative after surgery, so medical marijuana like these Peoples Champz pecan pies are perfect. Medibles are particularly useful for highly active patients who may otherwise resist medical orders for rest & recuperation. But I'm Not Sick - How Can I Enjoy These Pies? 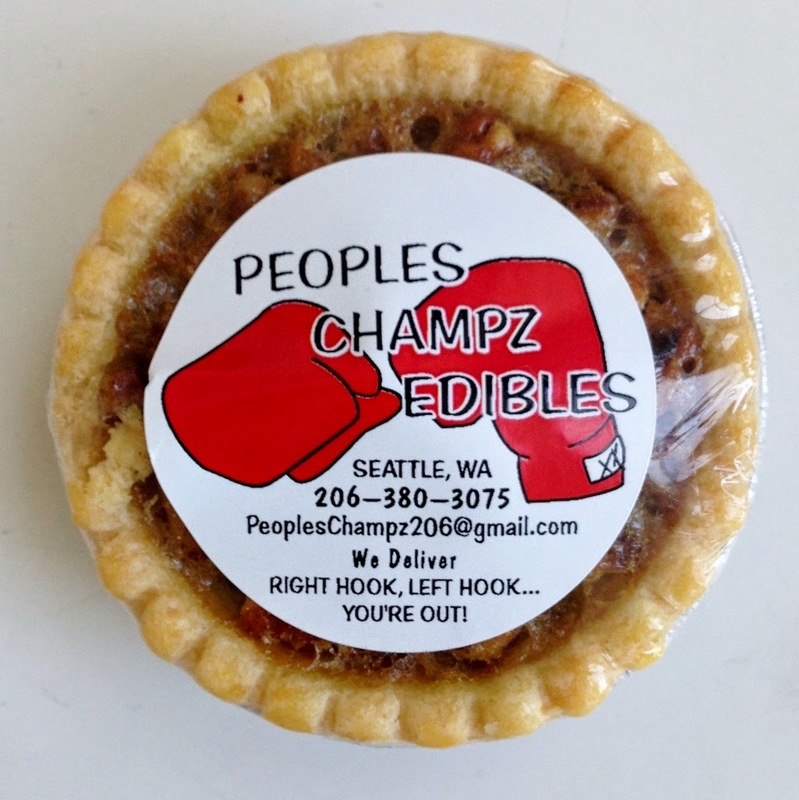 In the future, we hope the WSLCB will figure out how to integrate existing legitimate enterprises like Peoples Champz into the new recreational model and these top-notch pies could be available outside of the medical market. Until then, WA medical marijuana patients should be aware of significant impending changes which could make things very ugly about a year from now. But let's assume everyone decides to get along - how would a marijuana infused pie like this fit into the culinary landscape? The Champ's pies are a perfect choice to accompany a holiday meal complete with turkey and all the trimmings. Or these pies could make a simple Sunday dinner special. Just be sure to designate drivers and make sure nobody nods off into the collards. It's easy to pair medicated pecan pies like these with wine for a special event. We recommend muscat or an ice-wine for marijuana aficionados seeking something sweeter. A dry sparkling choice like a Procecco would provide an interesting texture contrast; for a sweeter bubbly, pair with an Asti. Calvados, a brandy, is the choice for those seeking to impress or just looking for something harder. The Champ can be found at the Rainier 'Galaxy' medical marijuana farmers market.